Brazil's Neymar scored twice for Barcelona - including a stunning second - as the La Liga champions comfortably defeated Villarreal at the Nou Camp. Neymar had side-footed home the opener in the second half, but saved his best until last, flicking the ball over a defender and volleying home. Luis Suarez netted Barca's second from the penalty spot after Munir El Haddadi was brought down. Barcelona face rivals Real Madrid in El Clasico in their next league game. Luis Enrique's Barca players take on Rafa Benitez's men at the Santiago Bernabeu on 21 November. Match ends, Barcelona 3, Villarreal 0. 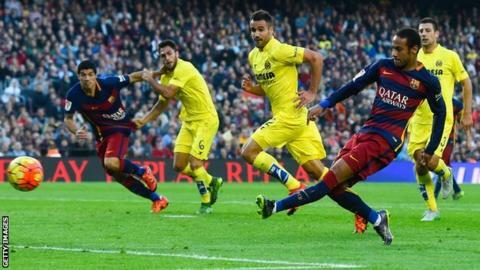 Second Half ends, Barcelona 3, Villarreal 0. Attempt missed. Luis Suárez (Barcelona) left footed shot from the centre of the box is close, but misses to the left. Assisted by Neymar following a fast break. Dangerous play by Roberto Soldado (Villarreal). Attempt saved. Mario (Villarreal) left footed shot from outside the box is saved in the bottom right corner. Assisted by Jonathan dos Santos. Goal! Barcelona 3, Villarreal 0. Neymar (Barcelona) right footed shot from the centre of the box to the bottom right corner. Assisted by Luis Suárez following a fast break. Attempt missed. Sergi Roberto (Barcelona) right footed shot from the centre of the box is high and wide to the right. Assisted by Neymar. Attempt missed. Sergi Roberto (Barcelona) right footed shot from outside the box is too high. Daniele Bonera (Villarreal) wins a free kick in the defensive half. Substitution, Villarreal. Samuel replaces Samu Castillejo. Substitution, Barcelona. Sandro Ramírez replaces Munir El Haddadi. Attempt saved. Luis Suárez (Barcelona) right footed shot from the centre of the box is saved in the centre of the goal. Assisted by Dani Alves. Corner, Barcelona. Conceded by Bruno. Daniele Bonera (Villarreal) is shown the yellow card for a bad foul. Goal! Barcelona 2, Villarreal 0. Luis Suárez (Barcelona) converts the penalty with a right footed shot to the bottom left corner. Penalty Barcelona. Munir El Haddadi draws a foul in the penalty area. Penalty conceded by Jaume Costa (Villarreal) after a foul in the penalty area. Substitution, Villarreal. Cédric Bakambu replaces Tomás Pina. Denis Suárez (Villarreal) wins a free kick in the attacking half. Attempt saved. Andrés Iniesta (Barcelona) right footed shot from the centre of the box is saved in the centre of the goal. Assisted by Sergi Roberto. Hand ball by Neymar (Barcelona). Dani Alves (Barcelona) wins a free kick on the right wing.